Edmund Optics introduces TECHSPEC DA (Divergence Adjustable) Fixed YAG Beam Expanders. These compact beam expanders are designed for demanding laser applications including laser materials processing, medical treatments, and research, and are ideal for both single unit purchases or volume integration. The expanders are optimized for common Nd:YAG wavelengths including 1064nm, 532nm, 355nm, and 266nm for high performance transmitted wavefront. Precision Galilean optical designs provide an impressive λ/10 transmitted wavefront error. These beam expanders can be adjusted to increase or decrease the divergence angle for precise divergence adjustment to compensate for input beam divergence. This beam expander family is manufactured using fused silica substrates that offer excellent optical and thermal performance and stability. TECHSPEC DA Fixed YAG Beam Expanders have an entrance aperture of 10mm and an exit aperture of 23mm in the 2X and 3X magnification models, while the 10X models feature a 7.5mm entrance aperture and a 26mm exit aperture. 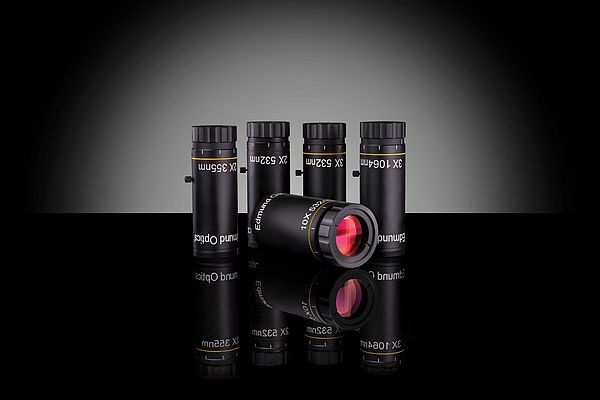 These optics feature laser line V-coatings for Nd:YAG harmonics down to 266nm. TECHSPEC DA Fixed YAG Beam Expanders are available in eleven models in 2X, 3X and 10X magnifications and mount with M30 x 1.0 threading for convenience and ease of use. Five different size thread adapters are available for conversion to C-Mount, M24 x 0.5, M22 x 0.75 M16 x 0.75 and SM01 threads. RoHS Compliant TECHSPEC DA Fixed YAG Beam Expanders are in-stock and available for immediate delivery.